Ivan Rodriguez may be the greatest catcher baseball has ever seen. Pudge combined elite defensive skills with a strong bat to play more games at the position than anyone else in history. He was also the most accurate backstop at catching runners attempting to steal. 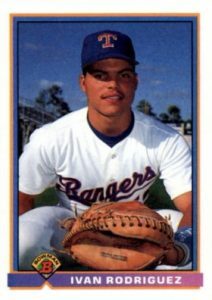 Take a look at the best Ivan Rodriguez baseball cards from his playing days, including his earliest releases. Rodriguez signed with the Texas Rangers in 1988 as a young prospect from Puerto Rico at just 16. He later became the youngest catcher in the league when he made his MLB debut in 1991. 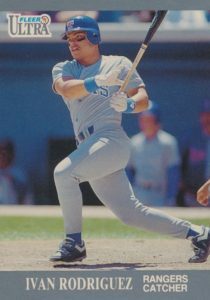 Pudge quickly developed into a perennial All-Star, earning the designation 14 times, and won an even more impressive 13 Gold Gloves. While he never found playoff success with the Rangers, Rodriguez made the most of his single season for the Florida Marlins as the team unexpectedly won the 2003 World Series. Already enshrined in the Rangers Hall of Fame, Rodriguez is eligible to join the ranks of the all-time greats in the Baseball Hall of Fame beginning in 2017. Shop for Ivan Rodriguez autograph cards on eBay. Given their limited value, Rodriguez has more rookie cards than could fit on this list. Completists can look to 1991 sets—Donruss The Rookies, Fleer Update, and Score Rookie/Traded—to find his other rookie appearances. As was the case with many of the releases in the early 1990s, the cards were so overproduced that they can be found at very budget-friendly prices. 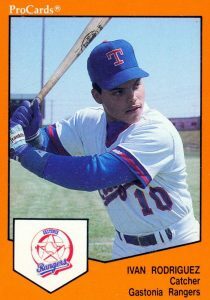 Pudge also has several key pre-rookie cards from his minor league days. This includes a few notable 1989 releases covered below. 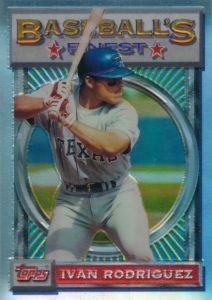 In addition, collectors can track down his '89 Grand Slam All-Star card for the Gastonia Rangers. 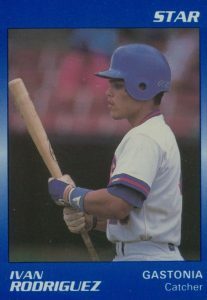 As Rodriguez moves closer to Cooperstown, fans might find a card in 1999 Topps Chrome particularly interesting. Part of the Early Road To The Hall insert, it featured up-and-coming stars who had a shot at the HOF and Rodriguez got the nod. As one of the best to play the game, Ivan Rodriguez has been paired with other legendary backstops on some remarkable cards. In 2004 UD Ultimate Collection, Pudge is teamed with 2016 Hall of Fame inductee Mike Piazza. In the 2012 Leaf Legends of Sports set, Rodriguez is shown alongside Carlton Fisk, who also shares his nickname of Pudge. Finally, in 2014 Topps Tribute, collectors can find a dual autograph with Rodriguez and the legend Johnny Bench. Ivan Rodriguez rookies are a bright spot from the era of overproduction and just the tip of the iceberg for collectors. His long and successful career with several teams has made him very popular in the hobby and a frequent inclusion in sets. The selection and placement for this list was largely based on card value, overall popularity with collectors, and card design. For the first time in 1991, Upper Deck issued an additional series to their standard set with the introduction of the ominously named Final Edition. This set included 100 cards divided into a collection of minor league prospects, called Minor League Diamond Skills, along with rookies who debuted in 1991 (including Rodriguez), and All-Star players. Along with rookies for Jim Thome and Pedro Martinez, Rodriguez's card is one of the top options. After the bright yellow set that was in 1991 Fleer, the company went with a more subdued, gray-border design for the debut Fleer Ultra set. The 400-card '91 Ultra base set was expanded further with a 120-card Update release that was only available as a complete set. Rodriguez's card, which features him admiring his hit, shares the stage with a rookie card for Jeff Bagwell as the must-have cards in 1991 Ultra Update. 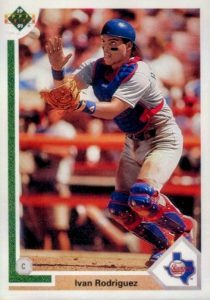 The first Ivan Rodriguez pre-rookie card on the list is found in 1989 ProCards. The orange-bordered card is one of my favorite early appearances for Rodriguez. It celebrates his time with the Gastonia Rangers of the South Atlantic League, which is made up of second and third-year players. The SAL includes minor league teams for most of the franchises in the AL and NL East. In his only season with the Florida Marlins, Rodriguez excelled as a veteran leader for the young team. On the road to the World Series title, Rodriguez was also named the NL Championship Series MVP as he batted .321 with two home runs and ten RBI. 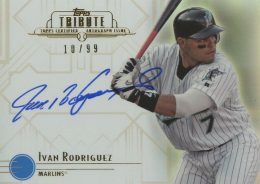 Collectors looking to honor the 2003 World Series run can find Rodriguez in a Marlins uniform in 2014 Topps Tribute and his autograph card comes in a host of parallels including blue, sepia, green, gold, red and purple. Pudge also has an autographed card in his Rangers uniform in the Tribute Traditions insert. As the minor league card market was exploding in the late 1980s with many new manufacturers, the Cadillac of cards was the Platinum Glossy version of the Star team sets. Those sets were limited to just 100 copies and Rodriguez was included in the team set for the Gastonia Rangers, which was the Rangers single-A farm team. The reverse side of the card has his basic information but the stats are completely empty as this was Pudge's first professional team. As the name denotes, the green-heavy Millennium Marks autographs from 1998 Donruss Signature Series were limited to 1,000 copies, although some stars would sign far fewer amounts. As one of the first "autograph in every pack" products, Signature Series also features blue Century Marks cards for Rodriguez that were limited to 100 copies. He is not part of the base red version, which varied in scarcity from player to player but frequently topped thousands of signed copies. 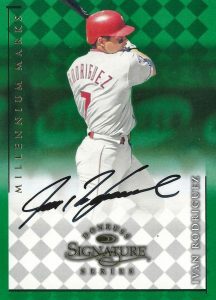 As one of the first Pudge Rodriguez autographs, his Millennium Marks card remains popular. 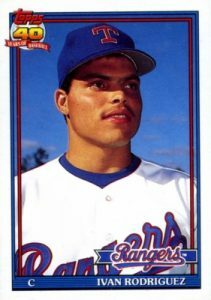 While the other Ivan Rodriguez rookie cards on this list are found in traded or update sets, Bowman included Rodriguez in their main 1991 set checklist before he played his first game with the Rangers. The stats on the back are left blank and it mentions that Rodriguez played for the Gastonia Rangers and Port Charlotte Rangers in the minors. Rodriguez would go on to rack up many impressive stats, including becoming the first catcher to have 20 or more home runs and 20 or more stolen bases in the same season. The Pudge Rodriguez Refractor parallels from 1993 Topps Finest can attract some of the highest prices across his cardboard canon. It is estimated about 250 Refractor copies exist for each card. Collectors opening a hobby box back in 1993 could expect to find two Refractors. In addition to his stats, the reverse side also notes that Rodriguez hails from Puerto Rico. While growing up there, he was a childhood baseball rival with his future Rangers teammate Juan Gonzalez. 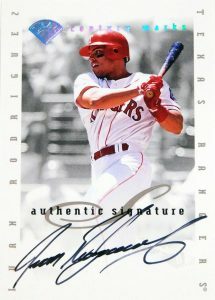 The success of 1996 Leaf Signature saw the company quickly issue the Extended Series that nearly doubled the checklist size. Although some players signed as many as 5,000 cards, Rodriguez would sign only 1,250 copies of his first certified autograph. Between the two series, Leaf resigned the cards and removed the foil stamp that was located in the middle of the card for the first run. Featuring a slanted signature, it's hard to distinguish the individual letters in Rodriguez's autograph outside of the first letters of each name. While all of the cards in the main 1991 Topps base set can also be found as a limited Desert Shield card, 1991 Topps Traded did not receive the gold foil treatment. Instead, collectors looking for a limited edition version of the Ivan Rodriguez Topps rookie should turn to Tiffany. 1991 Topps Traded Tiffany would prove to be the final release for the premium brand. It remains popular with collectors and gem-mint graded copies can reach $200 at auction. 1998 Leaf Rookies & Stars True Blue Ivan Rodriguez Parallel Card! RANGERS HOF!